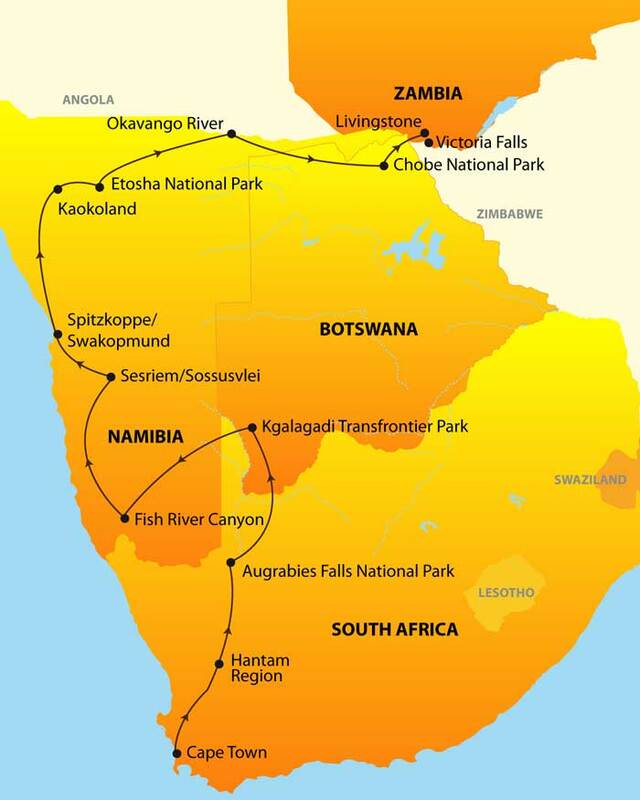 This exceptional camping safari that starts in Zimbabwe and travels through Botswana and Namibia to end in South Africa will be your window on the scenic and wildlife richness of Southern Africa. After two days of exciting activities at Victoria Falls, enter a world of filled with wildlife as you explore the Chobe and Okavango Rivers in Botswana. 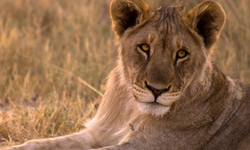 Once you cross into Namibia it is time to get up close to African animals in Etosha National Park before travelling on through amazing landscapes of rock, seashore and desert that define this fascinating country. In the Cape Province of South Africa you'll be astounded by the raw beauty of the Fish River Canyon and Augrabies Falls and the remoteness of Kgalagadi Transfrontier Park before encountering the sophisticated bright lights of Cape Town and its surrounding areas. Set against the majestic Table Mountain, Cape Town offers scenic, historic and cultural attractions. Depart from Breakwater Lodge at 08h00, for a peninsula tour. Driving along the Atlantic seaboard via Hout Bay and Chapmans Peak, we visit the Table Mountain National Park – Cape Point, returning along the Indian Ocean coastline back to our well situated Waterfront hotel. A morning or afternoon cable car ascent up Table Mountain is optional for clients’ own expense. Dinner can be enjoyed at the bustling Waterfront at clients’ own expense. Breakwater Lodge (or similar accommodation). Heading north we reach the coast at Walvis Bay and enjoy lunch while viewing the many flamingos feeding. We arrive in Swakopmund and spend the afternoon and following day exploring this German colonial town or booking one of the numerous optional excursions (own expense). Activities available include sandboarding, quad biking, skydiving, kayaking or scenic flights over the vast Namib. Accommodation in Guesthouse.